After learning about a Halo vignette contest at Brickarms forums with less than a week before deadline, I impulsively decided to enter. 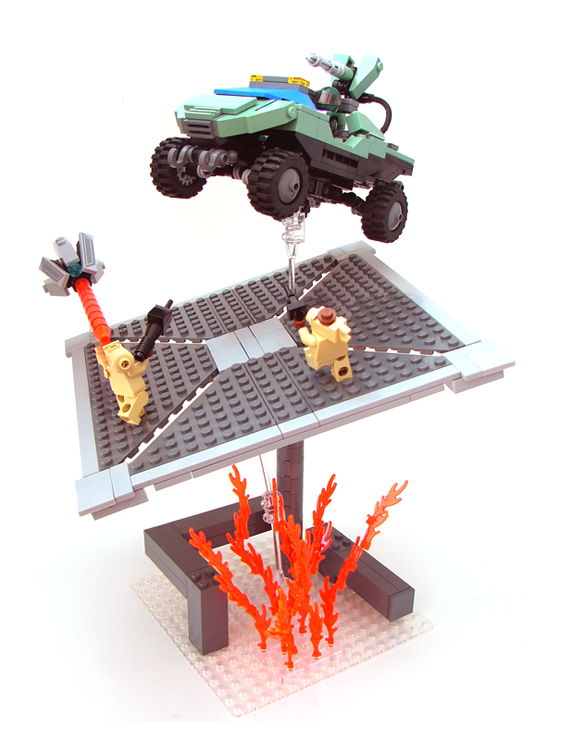 I needed an idea, and what’s more dramatic than the final warthog run from the last mission of Halo 3? For those who haven’t experienced it, you are driving a warthog through an expansive and volatile surface trying to escape a giant explosion. Classic? You bet. The warthog design is largely based off Legohaulic’s, with minor modifications. When will halo3 lego be coming out please let me know ok because i am a big fan of halo3 and lego. I built a worthog and a worith from halo3 but I broke them because they were not very good. Then I built the pelicon. bye. did u glue da fire?